In partnership with the Richmond Museum, the Richmond Art Gallery presents Eternal Return, an ambitious exhibition guest curated by Sunshine Frère presenting new works by five Vancouver-based artists: Barb Choit, Kevin Day, Lucien Durey, Alanna Ho and Anchi Lin. 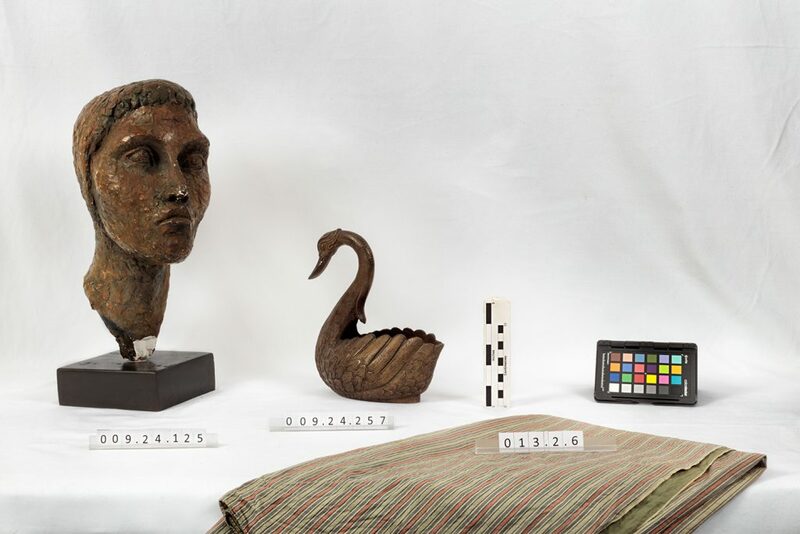 Each artist has selected artefacts from the Museum’s Migration Collection and developed works in direct dialogue with this eclectic array of historical objects. The products of this dialogue span a diverse range of media including performance, video, photography, sound, and sculpture. Artworks and the artefacts that inspired them will be on display in the gallery, allowing visitors to uncover their polymorphous histories. The title of the exhibition, Eternal Return is a concept that appears in philosophy, science-fiction, ancient history, and contemporary culture. It refers to the cyclical repetition of all things and situations throughout time. From the prestige an everyday item acquires when it becomes part of recorded history, to the surreal aura of a new or unknown artefact, this exhibition pays homage to the object and its power to invoke many returns. Barb Choit’s photomontage, Richmond Reconstructions, reflects on the still life. Collapsing centuries of art history and aesthetics into a single pictorial plane, Choit references the visual language of ancient Pompeii frescos to create a new still life featuring multiple museum artefacts. Artist Anchi Lin imbibes the performative qualities of her selected artefact in her work entitled A Sealer. Lin’s three channel installation circumnavigates the term preservation in relation to action, objects and memory. Kevin Day investigates relationships between knowing and being, seeing and listening, detached and embodied in his piece entitled study guide (speech to text mis-recognition and vice versa). Day’s work incorporates his selected museum artefact – a school desk and chair – into an immersive audio-visual installation. By nurturing innocent and deep play, artist Alanna Ho invites visitors into a red playroom where equal emphasis is placed on visual, aural and tactile exploration. Her work After My Garden Grows, has the makings of a child-like play-land, however further exploration in the space soon reveals that darker conceptual underpinnings are also on hand. Lucien Durey breaks down the identity of objects in order to illustrate their respective complex multiple histories. Shards of bottles, vases and many other glass elements are reconstructed into colourful, mobiles. Referencing pop-music, art history and the everyday, these sculptures are also part of Scarecrow, Visionary, Muse, Musa, Saguaro, Christiania, a series of recurring vocal performances by the artist that will occur during the exhibition run. Eternal Return at the Richmond Art Gallery will run concurrently with the Richmond Museum’s exhibition entitled, Our Journeys Here, which is part of the museum’s year-long conversation about what it means to be Canadian in Richmond. Both exhibitions feature artefacts from the museum’s Migration Collection. Artist biographies, artwork images and special events connected to this exhibition can be found below. The Richmond Art Gallery received a Canada Council project grant as well as a Richmond 150 grant in the support of this exhibition. The Richmond Art Gallery gratefully acknowledges the on-going support of the City of Richmond, Richmond Art Gallery Association, the BC Arts Council, and the Province of British Columbia. Sunshine Frère is a curator, writer and artist based in Vancouver, Canada. She holds an MA in Interactive Media from Goldsmiths, and a BFA in Studio Arts and Electroacoustic studies from Concordia University. Frère regularly works within local, national and international art communities. She currently sits as Strategic Initiatives Committee Co-Chair on Access Gallery’s Board and also spends time working with the New Media Gallery in New Westminster. Recent and upcoming projects include cache cache, a solo exhibition of her work at Seymour Art Gallery, Speculators of the Final Frontier, an experimental text exploring art and space for SADmag and Counteractive Subterfuge, an exhibition text for the 2017 Emily Carr University of Art + Design Low Residency MFA cohort. Barb Choit holds a BFA from Emily Carr University of Art + Design, an MFA from the California Institute of the Arts, and an MA in Modern Art and Curatorial Studies from Columbia University. Choit has exhibited widely at international venues such as the Queens Museum of Art, NewYork; Swiss Institute, New York; China Art Objects, Los Angeles; Cooper Cole Gallery, Toronto; Office Baroque, Brussels; and Aratoi Museum, Masterton, New Zealand. Her latest artist book, Ten Shows, was published by Or Gallery, Vancouver, in collaboration with Black Dog Publishing, London, UK. Recent solo exhibitions include Pronk at Rawson Projects, New York; and Pronk Boutique at Macaulay & Co Fine Art, Vancouver. Lucien Durey lives and works in Vancouver, British Columbia. Durey holds a BFA from Emily Carr University of Art + Design and an MFA from Simon Fraser University’s School for the Contemporary Arts. Employing a variety of media, Durey produces performance, sculpture, painting, photography and installation. Recent exhibitions include HOT DOG CAR WASH, Campbell River Art Gallery, 2017, Swimming Pool Blue, Achterhaus, Hamburg, 2016 and Hamsterly Farm Water Tower, Capture Photography Public Art Installation, 2016. Kevin Day was born in Taipei, Taiwan. He received his MFA from the University of British Columbia and is currently based in Vancouver. Day’s practice and research, focusing on concepts such as algorithmic culture, digital epistemology, and mediation, encompasses sound, video, text, graph, and media installations. He has presented his work and research nationally and internationally at locations such as the Vancouver Art Gallery, the Creative Media Centre in Hong Kong, Kunsthal in Aarhus, Free Word Centre in London, Qubit in New York, and Gallery 1313 in Toronto. Day has also authored several published articles on topics such as digital memories, sound, technology, and information. Anchi Lin is of Taiwanese heritage, she currently lives and works in Vancouver. Lin has completed a BFA from Simon Fraser University. Lin explores, negotiates and interfaces with concepts such as language, identity, gender and cultural norms. Lin works with video, performance and sculpture. Her work navigates the interstitial spaces of flux between individual and collective consciousness. Recent exhibitions and performances include: A Glass of Wine – with Alanna Ho at Centre A, 2017, Water, Digital Carnival Richmond World Festival, 2016, and Condensation: A Stage with Quiet Applause in conjunction with Cinevolution as part of Your Kontinent Pop-up Media Festival in Richmond, 2016. Alanna Ho is an emerging interdisciplinary artist based in Vancouver. Ho received a BFA in Music Composition and Theory at the University of Victoria. She further developed her practice at the Simon Fraser University School of the Arts. Ho combines deep play new media, and community engagement in her practice. She has performed at the Western Front, Gold Saucer Studios, The New Media Gallery, Tidal~Signal, The Anvil Theatre, VIVO Media Arts Centre, The Greater Art Gallery of Victoria, Centre A, and the SFU Audain Gallery. Ho is the founder of the Rainbow Forecast Project, a non-profit community and art initiative. RFP generates contemporary art discussions by allowing children to construct their own creative ideas in an interdisciplinary manner. Above: Barb Choit, Richmond Reconstructions, 2017.